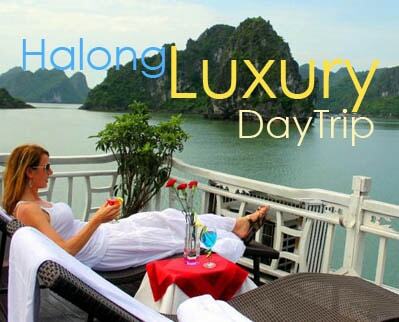 Genesis Cruise day tour is combining the luxury in service on traditional wooden junks and a 6-hour on board cruising to the Amazing cave of Halong Bay, introducing the stunning..
Estella Cruise Halong Bay day tour marvels at the hidden splendors of idyllic Ha Long bay - Lan Ha bay and wilderness in style and comfort that only..
JadeSails cruise day tour offer luxury cruise service of safety standard and also a completely unique itinerary, attentive service, authentic decor,.. Roll up your sleeves and immerse yourself in this interactive and funny making a folk artwork. This half day hands on experience gets you involve..
Half day tour by speedboat on Saigon River to Cu Chi tunnels, bring you complete different experience of the secrets of the Cu Chi tunnels, a vast..
A day trip to Ninh Binh to experience Tam Coc boat trip and eco life in rural Tam Coc with a visit to a local family with their traditional craft..
Day trip to Bac Ha Sunday market from Sapa, see the different and colorful ethnic minority coming to sell their homemade products or buy something for their family. You can meet..
Day trip Ho Chi Minh to Vung Tau, a beach side city by harmonious combination between sea, mountain with urban architects and cultural landmarks, you..
Day trip cycling to Tra Que vegetable village in Hoi An, enjoy wonderful time with the local family, visit the tranquil village, take part in.. Discover the beauty and exotic cultures of Vietnam's hill tribes with an overnight tour to Mai Chau - a small town nestled in the midst of a lush..
Bac Son valley is an ideal destination for photography travelers, especially during the peak season in July when the rice fields getting ripe and the..
Day trip adventure to the wild nature of Cat Tien National Park, also Cat Tien Biosphere Reserve for those who are seeking something natural, wild,..